Peter Tassi's latest book is a masterpiece of insight, wisdom and practicality, with a understanding of spirituality that goes beyond religious doctrine. We all deserve to be happy. In fact, we have a moral responsibility to live a meaningful, purpose-filled, and, happy life. When we do, we actualize our own potential and the potential of others, creating a rich and full life. 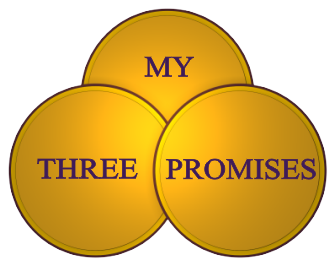 "My Three Promises" will help you unleash your infinite power and live the happy life. Our society promotes the material life with the illusion that material things, power, popularity, and instant gratification will promote a state of happiness. The problem is that these things do not promote true happiness and the happiness they promote are only moments of happiness. Moments are only moments. What exists between them is unhappiness. Don't settle for unhappiness! You are the author of your life and your own happiness. Don't let others mislead you. Free yourself of what small-minded people think, and find true happiness. You deserve it! The formula for happiness and the path to find it, as I have discovered it, is offered to you in this body of work. My discoveries were made based on research, reflection and the influence and inspiration of so many great and wonderful people. My struggle to find the path to happiness was brought to the forefront many times throughout my career as an educator, chaplain, mission worker and counselor to many students and staff. Often, in these sessions, I sought answers to alleviate their suffering and provide them with a path for happiness. This, combined with my own personal journey, served as a powerful motivation to walk the pilgrimage. "Grace filled and brilliant! An effective path to a healthy, wholesome and happy life. Start your journey to happiness with step one — reading this book!" "Through compelling, inspiring and funny stories I was motivated to begin my path to the virtuous and fulfilling life, becoming the person I always strove to be." "I couldn't put this book down. A brilliant formula and path that will awaken your true self and dramatically change your life." "Inspiring and Enlightening! A universal path to finding true happiness." "Peter Tassi offers a succinct and pragmatic journey of hope for those seeking to grow and achieve a refreshed understanding of self. By following the counsel and direction provided by Peter, you will be able to achieve clarity of vision about who you are and what is important in your life. Use this book as an opportunity to break free and embark on a spiritual quest to live a more genuine and fulfilling life."